"Carry a small pocket sized journal with you to act as a portable grimoire". A grimoire is "a textbook of magic, typically including instructions on how to create magical objects like talismans and amulets, how to perform magical spells, charms and divination, and how to summon or invoke supernatural entities such as angels, spirits, and demons." Do you have a "normal size" version of it? A lot of people don't. Now-a-days a lot of people keep all this information in their online bookmarks or in separate books in their bookshelves. So, what about making yourself a grimoire or book of shadows and starting to use it, actively? Actively and intentionally write a spell for every day, and see if it works, document the results, and make changes, and try to create spells that actually work for you. Note the date and weather and moon phase and astrological information, and any other circumstance that might have magical impact to your spell. Try to create magical objects like talismans and amulets. Write down your divinations, and get regular with it. Experiment with summoning - or communicating - with magical, mystical, mythical beings and entities and record your experiments. 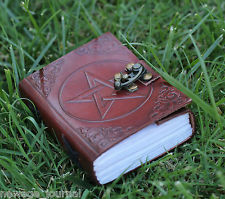 Now, carrying a notebook about your magical observations, ideas and spells you happen to encounter, is not a bad idea, but get a regular size BOS as well, and USE IT.